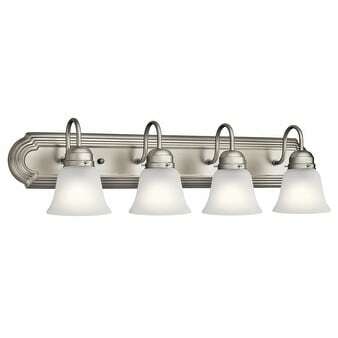 This 4-light bath/vanity light features a brushed nickel finish that will complement many traditional decors. Clean lines of the steel frame add interest while satin etched glass shades soften the light to create a warm ambiance for any bathroom or vanity space. Perfect for my new bathroom renovation. Exactly the size,color and amount of lights we needed for our space. Can’t wait to get it installed. Great price for a vanity light. It looks great in my rental home. Great value, bright LED bulbs installed for task lighting. Good quality and easy tomato install. Appearance is better that expected. Just what I wanted. Received on time and it is like pictured. Seems to work correctly. Very nice unfortunatly am going to used it in Africa. I need to replace current lighting and this one is very similar. "Can LED light bulbs be used in this fixture?"